When your goal is a recreational team-building program for a large group, and your budget is relatively small, the Adventure Team Challenge is a great option. 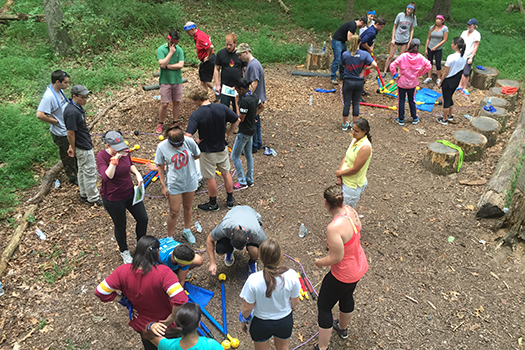 Teams of 8 to 12 participants will rotate through a series of team-building exercises, comprised of problem-solving initiatives, communication enhancers, and trust-building activities. The Final Challenge will bring these smaller teams back together for a large-group, problem-solving activity. The Adventure Team Challenge can be set up as a “friendly competition,” or as a themed event, at a university, conference room, or park in your area. Due to the rotational and recreational nature of this timed event, highly motivated, independent groups who work well together will gain the most benefit from the Adventure Team Challenge. Pricing is dependent on a number of factors – time of year, location, permitting, goals, etc. General pricing is seen below.